Welcome to the new term (nearly)! Please use the online booking form if you want to have a dedicated 30 minute session with a Learning Technologist to discuss Blackboard, student engagement, online assessment, etc. You may also be interested to try the Blackboard ‘Innovative Teaching Series’ (BITS) of training opportunities. 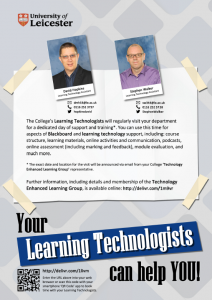 These weekly sessions share top “strategies and pedagogy for increasing educator efficiency and improving learning outcomes” – please talk to Stephen or myself if you would like to know more about this, or any other aspect of Blackboard.